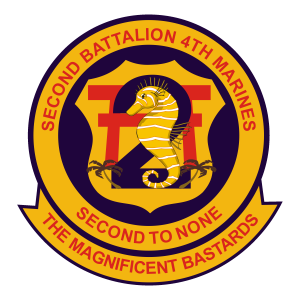 The long and illustrious history of the 2nd Battalion, 4th Marines began in April 1914 during WWI when it was activated as one of the three battalions of the 4th Marine Regiment. Shortly after being activated, the Battalion deployed to Mexico for expeditionary duty. Internal political strife in Mexico had become very tense and the safety of U.S. citizens in Mexico was in question. The presence of American forces offshore proved to be sufficient enough pressure on the Mexican government to act to end the threat to Americans. In 1916, civil war broke out in the Dominican Republic and the Dominican Government was unable to end the strife. President Woodrow Wilson dispatched American forces, which included 2/4, to protect American lives and bring stability to the Caribbean nation. Unlike its deployment to Mexico, 2/4 went ashore in the Dominican Republic and, after several clashes with rebel forces, successfully put down the revolution. Occupation duty followed pending the establishment of an elected government. The Battalion departed the Dominican Republic in August 1924 for San Diego, California. During October 1926, the Federal government directed the Marine Corps to furnish units to guard the mail because the postal service had experienced several robberies. The Battalion was directed to safeguard mail transported by rail and truck west of the Mississippi river. The robberies promptly stopped. April 1927 found the battalion en route to Tientsin, China, to once again protect American lives. Their mission was to reinforce American forces already in place against rebelling Chinese nationalist forces. Eventually, the threat to the international settlement eased and this caused a reduction in strength of the 4th Marine Regiment. On 4 October 1927, the 2nd Battalion, 4th Marines was re-designated as 2nd Battalion, 12th Marines. With this re-designation 2/4’s lineage and honors were transferred to 2/12. A new 2/4 would be activated in the future, but for lineage and honors purposes it would in no way be connected with the old 2/4. On 18 September 1932, in Shanghai, China, the new 2/4 was activated. This began the lineage of the 2/4 we know today. The Battalion supported the American sector of Shanghai after fighting nearby had broken out between Chinese and Japanese forces. The battalion’s presence deterred a Japanese takeover of the settlement after they had driven Chinese forces from the surrounding area. Deteriorating relations between the United States and Japan caused 2/4 to be withdrawn from China in November 1941. The Battalion transferred to Subic Bay, Republic of the Philippines, and was given the task of protecting the Olongapo Naval Station, later known as the Subic Bay Naval Station, which closed in December of 1991. The Battalion was ordered to move to the island fortress of Corregidor at the mouth of Manila Bay subsequent to the attack on Pearl Harbor. After unrelenting bombardment, the Japanese launched an amphibious assault on the island in May 1942. Though ill equipped and outnumbered, the 4th Marine Regiment fought valiantly; they were eventually forced to surrender on 6 May 1942 under orders from Major General J. M. Wainwright, U.S. Army. On 1 February 1944, the Battalion was reactivated on Guadalcanal with the Marines from 4th Battalion, 1st Raider Regiment. The battalion’s first assignment was to take part in the assault on Emirau Island. The objective of this operation enabled the construction of airfields on the island so that American planes could bomb the large Japanese base at Rabaul. The landing and seizure were unopposed. During the remainder of WWII, the Battalion saw action in both Guam (2/4 was the first ashore) and Okinawa. On Okinawa, the Battalion was involved in the fighting for the Motobu Peninsula, the capture of Naha and the assault on the Oruku Peninsula. Once organized resistance ended the Battalion was redeployed to Guam to prepare for the assault on mainland Japan. Following the surrender of Japan, General Shepherd, Commanding General, 6th Marine Division, selected the 4th Marines to seize and occupy the large naval base at Yokosuka in Tokyo Bay. This gesture was designed to avenge the capture of the “Old Fourth” on Corregidor. The Marines of 2nd Battalion, 4th Marines were the first American combat troops to set foot in mainland Japan, landing on Futtsu Cape. They were sent ashore to ensure the approaches to Tokyo Bay were secure. During the latter part of 1945, the Battalion maintained perimeter defense for the Yokosuka Naval Base, provided an interior guard for the base, and continued disarming the Japanese forces. On 1 January 1946, the Battalion was relieved of all duties in Japan and sailed for Camp Pendleton, California. In February 1946, as part of the demobilization, 2/4 was deactivated. The 2nd Battalion, 4th Marines was reactivated on 8 March 1946 in Tsingtao, China. Its first mission was to assist in repatriation of Japanese civilian and military personnel, as well as provide security for the American naval base at Tsingtao. The Battalion was relieved of this mission and sailed for Camp Lejeune, North Carolina in September 1946. The 2nd Battalion, 4th Marines was again deactivated on 18 November 1947. The Battalion was reactivated on 2 September 1952 for the Korean conflict though they did not see action due to the end of hostilities. The Battalion arrived in Japan as part of the 4th Marines on 24 August 1953 and was assigned the mission of defending southern Japan. To maintain its combat readiness, the Battalion trained in amphibious operations on Iwo Jima and Okinawa. The 4th Marine Regiment was transferred to Hawaii in 1953 and here the Battalion became part of the First Marine Brigade. The Battalion then settled down for a 10 year tour of duty. The 2nd Battalion, 4th Marines was once again committed to ground combat operations, this time in Vietnam, whereby, in May 1965, the Battalion landed at Chu Lai. Initial contact with the enemy was minimal though this soon changed as the Battalion took part in more aggressive offensive operations. The first major engagement for the Battalion was Operation Starlite (the first regimental sized battle by American forces since the Korean War) in August 1965. It was a combined amphibious/helicopter borne assault on enemy fortified positions of the Van Tuong Peninsula, 15 miles south of the Chu Lai airstrip. Six days after the operation had begun, the 1st Viet Cong Regiment was decisively defeated. During Operation Starlight, Lance Corporal Joe C. Paul (Hotel Company) became the battalion’s first Medal of Honor recipient. Paul placed himself between the enemy and his fellow wounded Marines until they could be evacuated. Although mortally wounded, he remained in the battle until he collapsed. His actions saved the lives of many of his fellow Marines. The next major confrontation between 2/4 and the enemy came during the siege of Con Thien in 1967. The Battalion, along with 3d Battalion, 4th Marines, was involved in stopping the enemy’s attempt to overrun the American outpost. During a month of bloody fighting, Sergeant Paul Hellstrom Foster (Headquarters and Service Company attachment) and Lance Corporal Jed Colby Barker (Fox Company) were awarded the Medal of Honor (posthumously) for their actions during that battle. The 1968 TET Offensive resulted in an increase in tempo of combat activity for 2/4. Bitter clashes between the Battalion and NVA broke out near Dong Ha. In this area, 2/4 moved forward to seize the fortified village of Dai Do. After three days of bloody fighting, 2/4, with the assistance of reinforcements, artillery, and naval gunfire, was able to secure the enemy stronghold. Though the cost was high for both sides, the enemy lost nearly 600 killed, while 2/4 suffered 80 dead and 256 wounded. The list of wounded included the Battalion Commander, Lieutenant Colonel William Weise. Two more Medals of Honor were awarded as a result of the fighting to Captain James E. Livingston, Echo Company Commander and Captain M. Sando Vargas, Golf Company Commander for their actions. Contact with the enemy tapered off during the fall of 1968, but picked up again in December. The Battalion was involved in a series of violent clashes near the DMZ and, with the aid of artillery and air strikes, were able to overrun a massive bunker complex. Late in 1969, 2/4 was withdrawn to Okinawa as part of the United States policy of gradually turning the war over to the South Vietnamese. In the early 1970’s, 2/4 participated with other units from the 3d Marine Division in providing battalion landing teams (BLT’s) as part of the Special Landing Force (SLF) off the coast of Vietnam. During the 1972 Easter Offensive, 2/4 actively supported Vietnamese Marines, U.S. Army Rangers and U.S. advisors ashore from nearby amphibious ships. During the summer of 1972, the Battalion participated in a massive disaster relief effort, Operation Saklolo, conducted in the northern part of the Philippines. In April 1975, 2/4 took part in Operation Eagle Pull, the evacuation of Americans from Phnom Penh, Cambodia. Less than 15 days later they took part in Operation Frequent Wind, the evacuation of Saigon, followed, a short while later, by the recovery of the USS Mayaquez. The Battalion moved to Camp Lejeune to join the 2nd Marine Regiment in October 1981, where they began participating in the Unit Deployment Program (UDP). During the late 1980s, 2/4 was reassigned to the 8th Marine Regiment to participate in the dedicated Marine Amphibious Unit (MAU), now called the Marine Expeditionary Unit (Special Operations Capable), rotation to the Mediterranean. The Battalion was once again called upon for a real-world contingency mission during the summer of 1990. The West African nation of Liberia was experiencing a civil war. The Battalion, as the Ground Combat Element (GCE) for the 22d MEU(SOC), set sail from Toulon, France, on 27 May, arriving on station 3 June for Operation Sharp Edge. On 5 August, the Battalion was committed to go ashore to take defensive positions at the U.S. Embassy to protect U.S. citizens and foreign nationals. The Marines embarked on amphibious shipping on 21 August after having successfully completed a Non-Combatant Evacuation Operation of 1,650 Americans and foreign nationals. In late December 1990, 2/4 deployed by air to Al Jabayl, Saudi Arabia, for Operation Desert Shield. During Operation Desert Storm, the Battalion fought as a Mechanized Infantry Armor Task force (Task Force Spartan) during the Second Marine Division’s attack into Kuwait. After the cease fire, the Battalion remained in Kuwait with the 8th Marines and conducted security and contingency operations west of Kuwait City. The 2nd Battalion, 4th Marines was the last Marine infantry battalion to withdraw from Kuwait, arriving in the U.S. on 15 May 1991. The Battalion deployed once more from White Beach, Okinawa, on 10 November 1998, to set in the defense outside of Kuwait City in order to prevent Iraq from taking the city again during Christmas 1998. The Battalion did not see any action, but was awarded the Armed Forces Expeditionary Medal, Navy Unit Citation, and Meritorious Unit Citation. From September through December 2001, 2/4 served as the Quick Reaction Force during Operation Noble Eagle for the western half of the United States, in response to the September 11th attacks on the World Trade Center and Pentagon. Deploying shortly after this mission as the 31st Marine Expeditionary Unit in Okinawa, 2/4 was called upon to give humanitarian aid to East Timor and served in country from October through November 2002. In February 2004, “The Magnificent Bastards” deployed to Ramadi, Iraq, the provincial capital of the Al Anbar Province, in support of Operation Iraqi Freedom. The Battle of Ramadi was pivotal for coalition operations in the Al-Anbar province. The Battalion, along with the 1st BDE, 1st ID, engaged insurgent forces in Ramadi in early April 2004. The battle began at midmorning when Marine patrols fanned out across Ramadi to provide security and search for roadside bombs. Three squads from Third Platoon, Golf Company, 2nd Battalion 4th Marines set off on separate routes. They worked their way west from a combat outpost to the government center, two miles away, where they would link-up and stand guard. During this movement, a squad was ambushed and the adjacent squads came under fire while attempting to rescue the ambushed squad. Insurgents armed with small-arms and RPG’s continued to battle the Marines for nearly two hours before the Marines could be effectively reinforced. It was one of the deadliest days of the war, but the Magnificent Bastards showed the insurgents that they were a far superior fighting unit. Marines and Army soldiers killed an estimated 250 rebels from April 6 to April 10 in fighting that shattered the insurgent offensive. Thirteen Marines were killed and 25 were wounded in the battle on April 6. Another four were killed over the next four days. The Battalion conducted support and stability operations (SASO) within the city and served with distinction while engaging insurgent forces in Iraq. The Battalion returned to Camp Pendleton in September 2004. The Battalion then served as part of the Unit Deployment Program tour in Okinawa, Japan, and the Philippines from April to December 2005. In early 2006, 2/4 was designated the Battalion Landing Team for the 15th Marine Expeditionary Unit. In November 2006, the Battalion arrived in Iraq again as part of the 15th MEU. From late 2006 through late spring 2007, Fox and Echo Company conducted operations in Ar Ramadi, while the BLT main body operated out of the Haditha area. From January to July 2008, 2/4 deployed to Okinawa, Japan, as the Battalion Landing Team for the 31st Marine Expeditionary Unit. BLT 2/4 spent time in the Philippines for Balikatan 2008, while Fox Company conducted training exercises in Indonesia. In May 2008, the 31st MEU supported Operation Response off the coast of Burma , due to the Cyclone Nargis making landfall in the Irrawaddy Delta. The Battalion has recently been deployed to Afghanistan for operations within that country. The 2/4 Association is a certified 501(c)(19) tax-exempt non-profit veterans organization (Tax EIN 31-1720488) formed to operate and administer members and former members of the 2nd Battalion, 4th Marines, United States Marine Corps (The “Magnificent Bastards”). This includes all personnel having been attached or assigned to the Battalion during its inception in 1911. Others may join as discussed in the Association Bylaws.